Many people have told me that my equipment in this department is the greatest and most varied they have ever seen. this is because I feel that nothing can take the place of having all of the important types of starting and lighting devices, each one mounted on an engine that will urn so that every student gets actual training and practice on all types of electric starters, which is the only way that I know of to enable him to "make good" in the automobile business as a starting and lighting expert. My course in this department is complete in every respect. I teach you installation, repairing and operation. Just a soon as you have mastered the theory -- the WHY -- I put you to work on the starters in our starter room. Here you have an opportunity to put your instruction into practice. Some schools attempt to teach this work from diagrams with perhaps one or two starters for the instructor's use only. This equipment is expensive and they don't have the facilities to give you the actual practice on real engines. I point this out to you so you will fully appreciate how to judge the importance of this equipment. 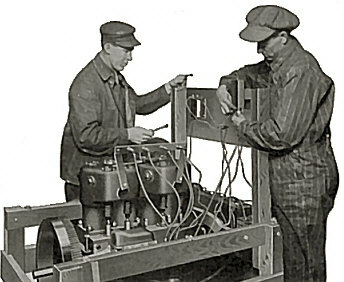 I give you the practical training on the machines themselves. Practically every new car today, from the light runabout to the big touring car, is equipped with some kind of a self-starter. At the present time there are nearly fifty different kinds and types of starting and lighting equipment, and to be an expert, you must be familiar with them all. You must have practical knowledge and experience, and that's what you will get here. Our starter course, like all of our other courses, is complete, up-to-the-minute in equipment, and carefully taught. Nine out of ten requests that come to my school for men for positions in the automobile business, contain a paragraph, something like this: "I want a good man to work in my shop. He must be a good starting and lighting man." You can thus see why it is absolutely essential that you must thoroughly understand starting and lighting troubles in order to be qualified to hold a position in this department of the automobile business. In addition to this, where there is a choice of men involved, the man whit a knowledge of starting and lighting troubles is invariably given the preference. 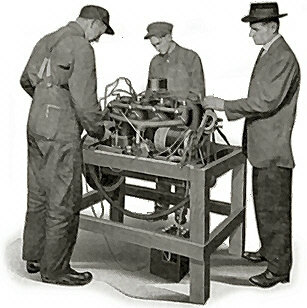 This is best shown by the fact that in the past year or two I have had a great many old time repairmen, men who picked up their knowledge of the trade by experience, come here to my school to get this complete course of practical training in starting and lighting equipment, because they found that the automobile business today demands it in order for them to make good.